This is a birthday card that I made for my daughter's best friends little girl. She's turning 5 and I thought the little princess with the fairy godmother would be perfect for her. I am entering this card in the following challenges. Wow! What a lucky little girl! It is adorable! Wow what a beautiful card.Absolutely georgeous!!!! Won't this little girl be tickled pink! Great card for a little girl. Could not be more perfect. 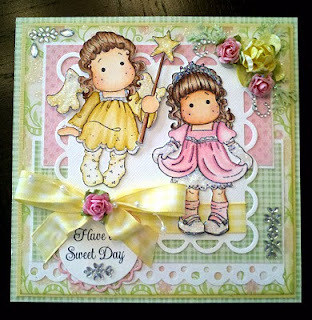 Such an adorable, sweet, pretty card for a little girl! Very well done and beautifully colored! What a lucky little girl.....she will love this sweet card! Beautiful job!!!! Very sweet girls. so pretty. That's darling. Can't imagine a sweeter card for a little princess. What a beautiful card Julie! Sooo girlie and perfect for a little girl. Love your coloring and layout,wonderful job!!! I think it is absolutely adorable...what a beautiful job you did on everything. She will love it. 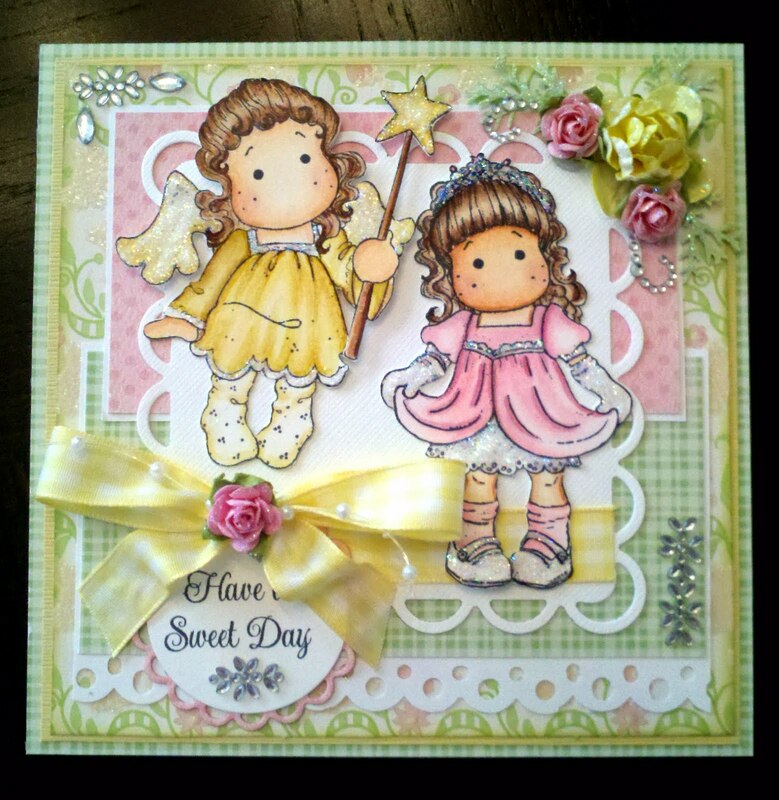 Thanks for joining Stamptacular this week! This is gorgeous hun! What a beauty! Thanks for joining us at WOC! Oh my goodness - look at those adorable girls! Great card!! Thanks for joining us at the 7Kids challenge! so pretty! I'm sure she loved it! Thanks for linking up to the All That Scraps Magnolia "Let's Celebrate Birthdays" Challenge! So glad you did! A unique concept makes it memorable even years after because you do something different.And things that are personalize will treasure forever.